The CEC’s Open Space Strategy seeks to address the main challenges by promoting healthy lifestyles, mitigating and adapting to climate change and making good use of land by ensuring the provision of new open spaces, often as part of new developments. This will help compensate for the decrease in financial resources available for new green spaces. The Strategy also seeks to create or improve access to existing spaces, as well as making strategically significant improvements to such spaces, and includes a proposal to increase the number of allotments and community gardens. As an example, the National Health Service Lothian proposes the creation of new community gardens as part of a redevelopment masterplan at the Royal Edinburgh Hospital in Morningside. Encouraging small-scale communal food growing areas in tenement backgreens (shared green spaces behind tenement squares), often facilitated by the Edinburgh Community Backgreens Initiative, can help meet sustainability and health objectives. Edinburgh’s green network forms part of a wider Central Scotland Green Network (CSGN), which is identified as a national development in the National Planning Framework. The Edinburgh and Lothians region covers about 171 500 ha, and its Forestry and Woodland Strategy 2012–2017 Vision aims to create expanded networks of woodland by 2050. This will contribute to a strong, sustainable economy and is an important element of a healthy, resilient environment as well as playing a major role in the quality of community life. There is a five-year target to support the creation of at least 180–250 ha of new woodland each year across the region and to improve the woodland habitat network (although most of the opportunities for this are in the surrounding regions). In terms of climate change, the strategy seeks to promote woodland management and creation as a key component of sustainable flood management initiatives, while using both the expanding woodland cover and compensation of any woodland losses to development by means of new planting, to increase carbon sequestration and reduce net carbon emissions. Sustainable Edinburgh 2020 (SE2020) also provides opportunities for NBS, with its vision of Edinburgh as a ‘low carbon, resource-efficient city, delivering a resilient local economy and vibrant flourishing communities in a rich natural setting’, where people have easy access to green space and natural resources and protected and conserved. Initially, the FP7 project GREEN SURGE was involved in mapping domestic garden features such as trees, shrubs and grass, which then could be correlated with pollinator presence. This work is being followed up by the Pollinator Pledge project which aims to encourage 10 000 individuals, organisations and businesses to get involved in creating more pollinator-friendly green spaces in Edinburgh and to enable the CEC and other landowners to understand how, and where, they can improve green spaces for pollinators across the city. Granton Community Gardeners is grassroots community gardening initiative in an area of multiple deprivation in northern Edinburgh. It was started in 2010 by local people living in flats without a garden, who wanted to grow vegetables near their homes. It is a good example of a project with multiple benefits, as it generally aimed to enhance green spaces, support gardening and food production, promote community cohesion and encourage healthy habits and environmental awareness. The benefits, however, have been more in terms of the social dimension. The Duddingston Field Group is made up of local residents who came together to request a lease on a 2.5 ha field which had become vacant. They aimed to create and manage semi-natural habitats, especially woodland, using sustainable practices and promoting environmental education and recreation. Since that the group’s aims were compatible with the CEC’s approach to green space management, the CEC supported the initiative, and the group has planted more than 2 000 trees, a community apple orchard and a willow coppice, and has created walkways to improve access (GREEN SURGE City profile). A Social Return on Investment valuation of Edinburgh’s parks concluded that they are worth over £100 million per annum, primarily due to the revenue they generate from visitors for local business and the economy (£51 million per annum). Their health and well-being benefits are worth £40.5 million per annum and their impact on social inclusion and community capacity is calculated to be worth over £6 million (CEC, 2015). Using the i-Tree Eco model, it was estimated that in 2011 the structural value of trees in Edinburgh was £382 million, as they provided £484 689 per annum of non-traded value through net carbon sequestration that year. The total value of carbon stored in Edinburgh’s trees would accrue to £35 million by 2050 (CEC, 2014b). The carbon stored in the trees of Edinburgh is equivalent to the annual emissions of 20 801 people. The annual value of Edinburgh’s urban forest is calculated as £1.82 million, with carbon sequestration worth £1 million, air pollution removal £575 000 (avoided damage to health, buildings and crops) and £247 000 in avoided wastewater charges through rainfall interception and stormwater retention (Forest Research, no date). Such figures can provide a starting point for dialogue, but a full asset valuation is probably needed to produce real changes in the perception of the true economic value of green space. The mapping of the city’s green infrastructure, and its quality, carried out as part of the Open Space Strategy has led to developers paying for green space improvements across the city and to better coordination of green space investments by different departments. Increasingly, community groups and other stakeholders can help the Council by applying for third-party funding. In St Andrew Square, Essential Edinburgh took the lead in organizing consultations involving the private owners, the CEC and Scottish Enterprise. Successful negotiations resulted in the implementation of a £2.6 million programme of improvement works, funded by the CEC and Scottish Enterprise. 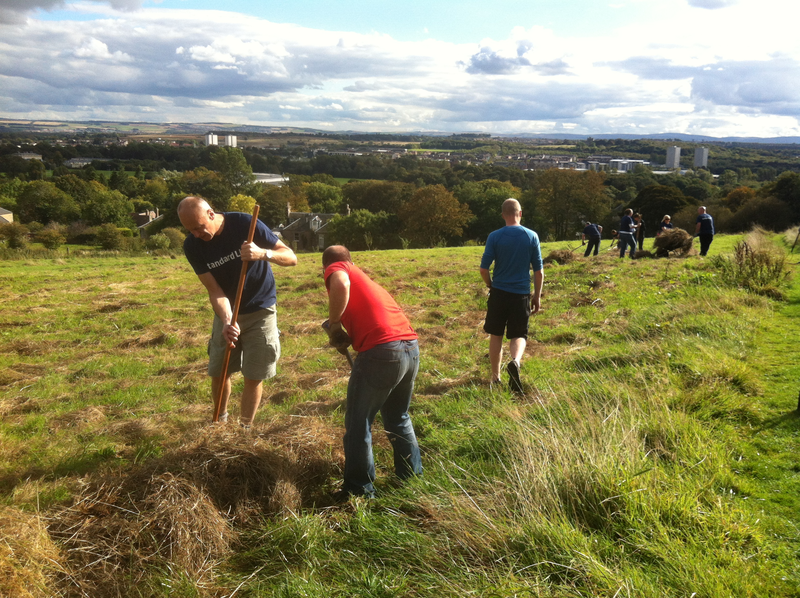 In the case of Granton Community Gardens, businesses made contributions, either financial or in-kind, as part of their Corporate Social Responsibility Programme, while volunteers contributed tools and materials. For Duddingston Field Group, the main source of funding is grant aid, but it also receives donations, both financial (e.g. apple tree sponsorships and organizing events) and in-kind (e.g. trees). Budget cuts are a challenge, so there is a strong desire to increase the involvement in planning of community groups, NGOs and business representatives. The obligation imposed upon developers to deliver green space as part of new planning proposals is unique to cities within the British planning family, and provides a real opportunity for planners to improve the city’s GI (GREEN SURGE D7.2). An exercise aimed at mapping the city’s GI and its quality, carried out as part of the Open Space Strategy, has already resulted in developers paying for green space improvements across the city’s network. Moreover, it has led to better coordination of green space investments by different departments (GREEN SURGE D7.2).